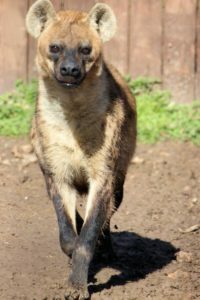 Animal World & Snake Farm Zoo’s featured animal for January is the Spotted Hyena. We sat down with our Mammal Department Manager, Chelsea Godwin, to talk about these amazing creatures, and answer some questions submitted by our Facebook and Instagram followers. 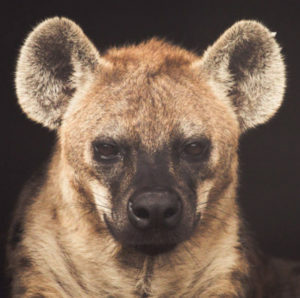 Before we get started talking about our Spotted Hyenas, tell our readers a little bit about you. Well I’ve been at Animal World & Snake Farm Zoo for a little over two years now. Before that, I worked at a zoo in Florida with all kinds of animals from lions and tigers to squirrel monkeys and zebra. Because of my large carnivore experience at my previous job, I was immediately drawn to the carnivores here at Animal World & Snake Farm Zoo. Especially the Spotted Hyenas! I had never worked with them before, so getting to learn about these unique species has been great. Can you tell us a little bit about the two Spotted Hyenas we have here at the Zoo? Sure! The two hyenas who call AWSFZ home are Sniffs and Songa. The easiest way to tell them apart is by looking at their paws. Songa has dark black paws, and Sniffs has light brown paws. Songa is the more dominant of the two. He’s extremely curious and a lot more in your face than Sniffs. Sniffs is a little more laid back and tends to be more reserved than Songa. As his name suggests, Sniffs loves sniffing new things to investigate them more closely, where Songa will just jump right in. What does daily care look like for the Spotted Hyenas? Every morning before we open to the public, I shift the hyenas into their “bedroom” area at the back of their exhibit. Basically, it’s a secondary area that securely houses them while I go into their main exhibit. After securing them in their shift area, I go into the main exhibit with a scrub brush, rake, and shovel. I clean out their water bowl and rake up any feces, leaves, and/or twigs that have accumulated overnight. I also walk the entire exhibit to check for structural integrity and any potential safety issues. Sometimes we give out enrichment in the morning. They love getting new toys like the big giant Boomer Balls, or seasonal items like Christmas trees or pumpkins. After all of that is done and I’ve left the exhibit, I check all of the locks, secure the exhibit, and let them back out into their main area for the day. Both Sniffs and Songa love flowers. I’m not exactly sure what it is about them that they love so much, but anytime we give them flowers, they carry them around in their mouths all day. They also love big boxes and Christmas trees. The boxes wrapped in Christmas paper was a huge hit with them during our Christmas with the Critters event. 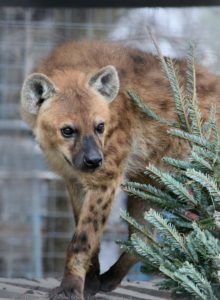 Neither of our hyenas are big on scent enrichment though. They do! The cackling noise they make is usually a response to excitement or fear. If you’ve ever been to one of our Carnivore Feeding Shows, you’ve probably heard them laugh right before we start feeding them their treats. 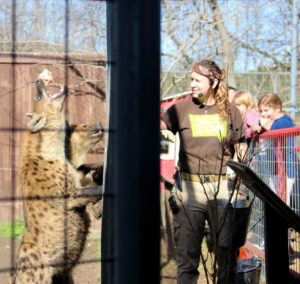 We feed the hyenas once per day during the Carnivore Feeding Show. Except for Tuesdays. Tuesdays are their fasting days. Most days, each hyena gets approximately 5 lbs of chicken and 3 lbs of beef. We also feed them a special exotic carnivore pre-made diet called Nebraska. 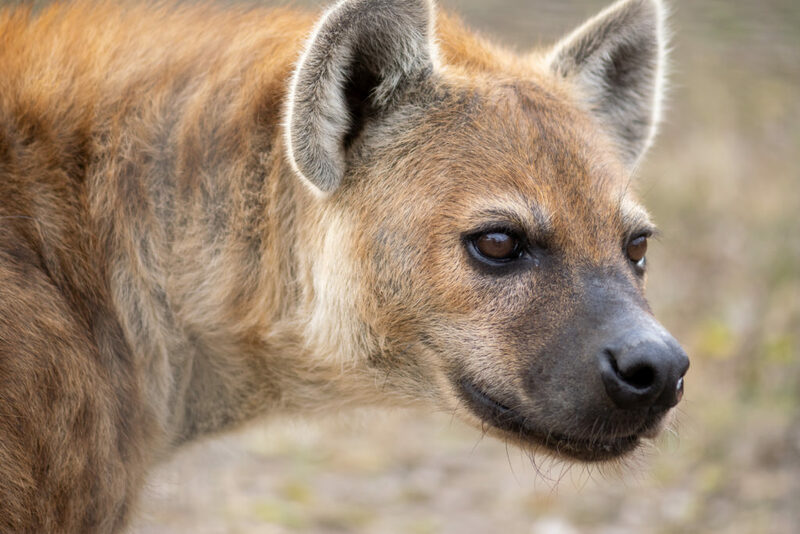 In their natural habitat, hyenas eat just about any animal they can hunt down. Things like wildebeest, zebra, and impala. They also have been known to scavenge and eat carrion. Females can get up to 140 lbs, while males tend to max out around 120 lbs. What is your favorite thing about working with hyenas? My favorite thing is being able to educate people about how awesome these creatures are. Hyenas get a bad rap from the Lion King… everyone just kind of thinks of them as the silly sidekicks. 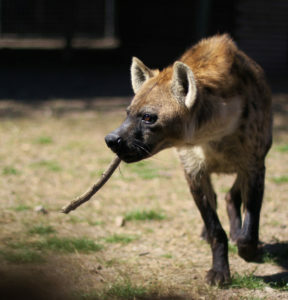 What most people don’t realize is that hyenas are even better hunters than lions! 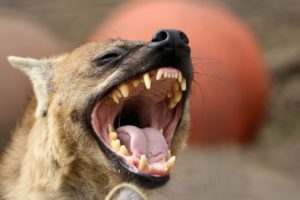 Not only do they have a better success rate when it comes to hunting, but hyenas are also known to chase lions off of their fresh kills all the time. Their jaw pressure is right around 1100 psi, which is twice that of a lion. Not to mention, they are incredibly intelligent, with massive brains and one of the most complex social hierarchies of any carnivore. Plus, females are dominant to males! What’s not to love about them? 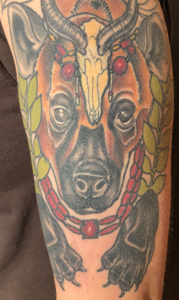 Keeper Chelsea loves hyenas so much that she recently got a tattoo of one on her arm.